Erke » Roger Perron Inc.
At the beginning of the year, I decided it was time to fix up my childhood home. Having thought about it for years, I knew some of the things that I needed and had some ideas of what I wanted. My biggest hope was that I would find someone who looked at my 1925 home and saw and respected the character of the little old house and would help me find a way to keep and enhance those features. Lucky to say I found the right person! Your first visit gave me a glimpse into what could be done with the house. Keeping the character, respecting the features and maximizing the space is what I recall from that discussion. Seeing your designs during the design process was exciting and I felt like I could envision the finished project. Six months of work and my old house is beautiful. A small addition and comfy deck, strikingly beautiful bathrooms, a fantastic new kitchen, reconfigured space and completely refurbished does not tell the whole story. Your attention to all the details, including the small ones, made the difference. From your guidance in selecting the right cabinet doors to ensuring the final cleanup was done in detail, you had your eye on all of it. As well, your patient and thoughtful time spent with me to select just the right granite and tiles results in a daily appreciation of your artistic and creative vision. Every member of your team made the project easy. I appreciate the detail that was provided when I asked questions and the care that was taken in fixing up the old place. From the demolition team on the first day to Mark wrapping up the finishing touches, it was a smooth and satisfying process. When people think about remodels, they often talk about all that can go wrong. I am so happy to be able to tell a different story. 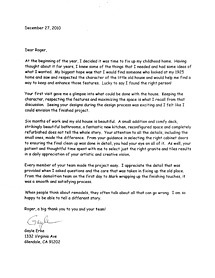 Roger, a big thank you to you and your team!